Invictus Beduinos won the R$250,000 Bank of America GP Jockey Club South America Racing Challenge Saturday at the Jockey Club de Sorocaba, earning the first invite to the 2019 Bank of America Challenge Championship in Albuquerque. 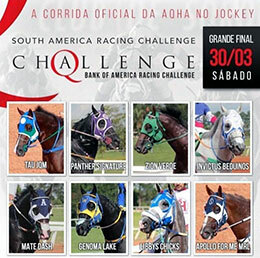 SOROCABA - SP, BRAZIL—MARCH 30, 2019—Invictus Beduinos, a 4-year-old son of leading sire Separatist, defeated Libbys Chicks by 1-¼ lengths in the R$250,000 Bank of America GP Jockey Club South America Racing Challenge Saturday at the Jockey Club de Sorocaba. Panther Signature finished an 1-¼ lengths back to take third. The win was worth R$50,000 to the winning owners, R. Horizonte and Ana Dantas Dantas. Conditioned by R. Rosa, Invictus Beduinos completed the 440 yards in :21.459 seconds, a 93 speed index. Jonatas Dantas, H. Sta. Maria and H. Luis bred the colt in Brazil from the Holland Ease mare Beduinos Baby Filly. E. Pereira had the riding assignment. Should her connections decide to send her to the US, Saturday's win also earns Invictus Beduinos a starting spot in the Grade 1 $250,000-est. Bank of America Challenge Championship on October 26th at The Downs at Albuquerque. Runner-up Libbys Chicks, a daughter of Chicks Boudro from the Feature Mr Jess Libbys Feature, races for owner Haras Sao Matheus. She earned R$25,000. M.C. Cruz saddled with R. Pereira up. J. Bispo saddled third-place finisher Panthers Signature, a 4-year-old Panther Mountain gelding from the Granite Lake mare Sign In Granite for owner Haras Princess Neini. Ridden by jockey D. Oliveira, she picked up R$ $17,500. Tau JQM, Genoma Lake WA, Apollo For Me MRL, Zion Verde and Mate Dash completed the field.